I’ve cleaned off one shelf, can I clean off another? I’ve emptied a drawer, can I empty a cabinet? I’ve freed up a chest, can I free up a closet? Can I live without this spoon? Yes. This bowl? No. This shirt, these shoes, this necklace, this book case, these videos, this mug, this plant, these sheets, this rug, this sofa, these pillows, this blanket…this complicated and over-full life? 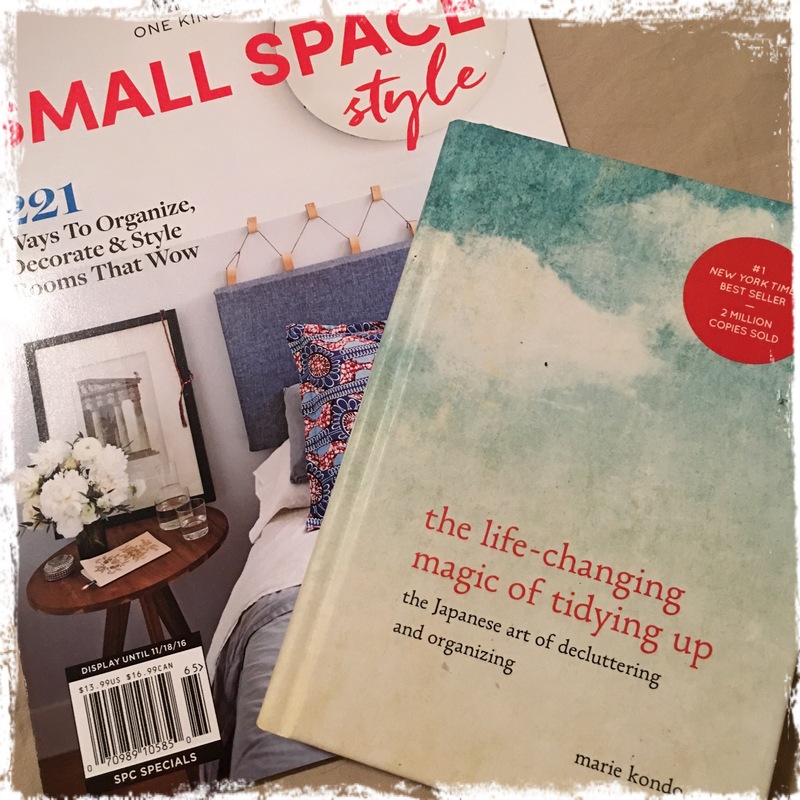 In The Life-Changing Magic of Tidying Up, Marie Kondō suggests a very different, very disciplined approach to de-cluttering. The central tenet of the book seems, at least to me, to be focusing — in this case on the things, not their location in the house, which is the traditional way of tidying up and often results in nomadic, rather than reduced, clutter. Focus is not my strong suit, to put it mildly. So, the approach made sense, at least on the surface. I set off to give her system a try. And almost immediately failed. Discard by category, not by room? Right. I ended up wandering the house aimlessly, distractedly looking for all the items in the category. By the time I found them all (or remembered what I was looking for when I started), I was too tired to care. And what if I missed something? Or mis-categorized it? Hopeless. Tidy all at once, not a little every day? OK, but if I’m gathering all of the items in a category in one space so I can look see what-all I have, I’ve just rendered that table/sofa/bed unusable while I (inevitably) agonize over my decisions. And she’s telling me it might take six months to complete the whole process for all our possessions? Some of us have day jobs! I seriously thought Kondō was a nut-job. As time slipped by, and the pressure to get my possessions under control increased, I started panicking. Why was I struggling so hard? What, really, was my underlying resistance to discarding my belongings? The answer was simple, if not easy to resolve: My anxiety and scarcity-thinking (“what if?”) were holding me back. I was continually delaying, even avoiding, making decisions, and the wheels fell off the whole process as a result. It was frustrating. So, how would I get around this barrier to my successfully becoming a minimalist? Oddly, it was the practicalities of moving into my dream home — a yurt in the mountains — that provided me with the clarity I needed: What will fit into a 20-foot-diameter space with no closets? And an effective motivator. I took a deep breath and dove back into my clothes and shoes — one of the “easy” categories, for me, since I have few emotional attachments to my clothes. Soon, I was carting boxes off to Goodwill a truckload at a time and paring down to the bare essentials like a pro. I was even managing to work for a living as I sorted! Clothes, kitchen utensils, jewelry, shoes — gone. Board games, craft supplies, sports and leisure equipment — all of which had been gathering dust in various and sundry closets and corners and plastic storage containers– found new homes. I dug deep. As I did, I felt lighter and freer. But I still had — no, have — too much stuff. At some point, I realized that Kondō and I have different goals: She focuses on tidying; I’m focused on gutting. So, while her system is extremely useful, it stops somewhat short of the degree of minimalism I’ll need to achieve if I’m to preserve the open spaciousness a yurt offers. I also have to walk a very careful line between keeping just what I need to live and making my life uncomfortably Spartan. Financially, I won’t be able to replace things on a whim, so my selections for the discard pile must be carefully considered. And I’m too old and soft to comfortably go hard-core with my minimalism, making my task harder, in some ways, because I can’t — or won’t — just ditch it all and walk off into the sunset with nothing but a backpack and my dog. Nonetheless I’m making progress, albeit by cheating a little. With my 20-foot-diameter motivator firmly in mind, I’m making multiple passes through my house, category by category, sometimes mentally earmarking items for later removal. This process often involves packing items away for a few weeks to see if I go looking for them later. If I do, they come out of the box; if I don’t, they get hauled away. Furniture items need to stay in place until I’m ready to move, although some of it will be donated rather than come along for the ride. So I’m not clearing my house all at once, but I’m making steady progress toward the end goal. In the meantime, I keep doing my research into composting toilets (They don’t all stink! ), grey-water catchment systems, solar power…and all of that stuff, much of which lives (or will live) on my Pinterest boards.